Laughable. That's what this is. I mean I literally saw the story and laughed! Evidently early explorers made a mistake when they drew the Tennessee/Georgia border 200 years ago. Evidently Georgia lawmakers know that they had a faulty compus. And conveniently, the new border would put georgia's territory juuuust above the Tennessee river allowing Georgia to freely pump billions of gallons of water to metro Atlanta. And when I say just enough I mean it would be basically enough to build a pumping station and not much else. Convenient. Seriously people. This is not the way to solve this problem. Insted of bickering and trying desperate mesures that really just make your state look stupid, as this obviously is, why don't you try and come together and solve the problem with your neighbors rather than fighting them? In the end, that's what its going to take to solve this problem which is increasingly becoming regional rather than one state's problem. Georgia can want to change the border all they want, but it would take both sides to agree to a border change for it to occur....likely odds of that are about zilch. I suppose they might try to get it into Federal Court but I can't imagine any court would want to start that sort of precedent. Virginia tried to change their border earlier with Tennessee and lost. Seems like the early surveyors shortchanged Virginia even more than Georgia. Evidently Tennessee made out like a bandit on both the northern and southern borders as surveyors gave Tennessee more territory than between the 35th and 36.5 parallels as originally intended by Congress. Some parts of Tennessee's border with Kentucky are off by up to 9 miles. The Georgia Tennessee border is off by only one mile. Problem is 200 years have passed, and it's Tennessee now, no matter what anyone else says. Georgia hasn't got a snowball's chance in hell of getting this changed. They're desperate for water, and this attempt to get some will fail. Here in Chattanooga, what they are proposing would have profound effect. The entire city of East Ridge, population 20,000, would move from Tennessee to Georgia. The entire East Brainerd area, which I live in ,would switch from Tennessee to Georgia. I wouldn't be surprised if nearly 50,000 people would be involved, and every one would be madder than hell when realizing than Georgia would be asking all of them to pay income taxes, which today's Tennesseans don't pay. This is old news anyway. Early in the 20th century, Georgia tried to claim the Ducktown/Copperhill Basin and all of its mineral wealth. That attempt was unsuccessful anyway. I have no doubt this fuss will go nowhere. Looks like Georgia wants to tap that big wet Tennessee body. I guess its natural, living together and being so interlocked makes for such passion and lust. 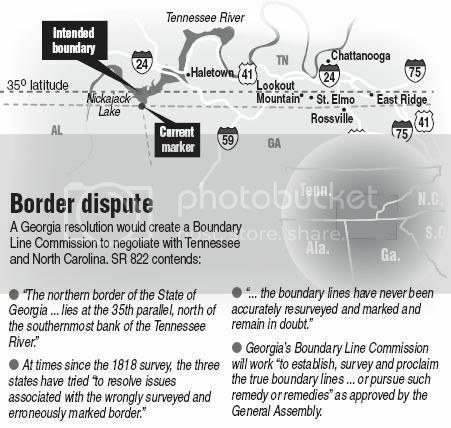 Here is a graphic (from the Times Free Press) of how the border would change in the Chattanooga area. There were a number of news reports on TV and they all said that history is on the side of TN when it comes to these cases and the land markers carry a lot of weight. One news station actually went to the old land marker that marks the GA/AL border which runs even with the TN/GA border. Of coarse as stated earlier any change has to be approved by both states and congress. All the TN legislature has to do, is not to respond. GA. does have serious water problems and I for one would not be opposed to selling water to them via an aqueduct from the Tennessee River. ^that would make perfect sense too. Tennessee has more than enough water and with the really tight budget year we are about to endure, selling water to GA would seem like a smart move; especially sence I'm sure by this point, GA would be willing to pay top dollar. On the other hand, with changing climate and droughts becoming more and more serious for the southern region, prudence wouldnt be a bad idea either. Georgia needs water but so does Tennessee. Maybe do some research and get with TVA on the matter to see what would be a reasonable amount to sell to GA and go from there maybe? 1. The Tennessee Legislature voted 91-0 not to participate in a commission to settle the border dispute. 2. The Georgia House of Representatives actually voted in 1972 to accept the location of the Tennessee state line with Georgia at its current location.